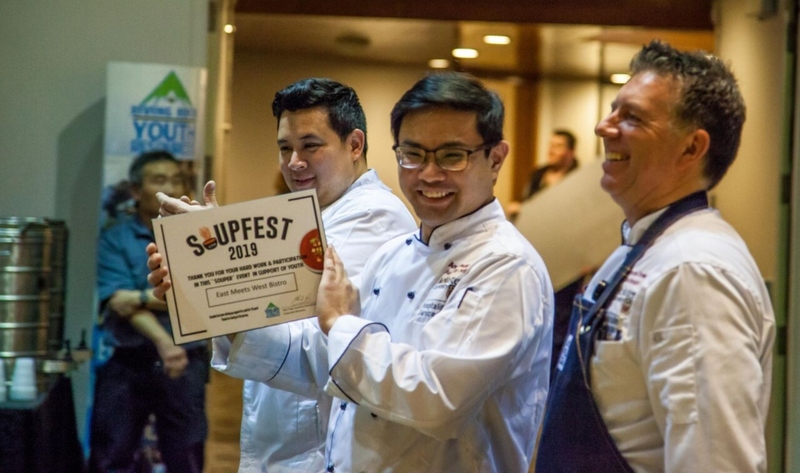 Led by East Meets West Bistro assistant chef Andy Leung, the McMaster team won top prize for most creative soup at Hamilton’s annual Soupfest event in February, a fundraiser for Living Rock youth resources. The Buffalo chicken soup also placed third best overall, based on attendee voting. Leung says their secret ingredient was a Tabasco “caviar” garnish: little pearls of Tabasco hot sauce generated by a chemical reaction called reverse spherification. McMaster executive chef Paul Hoag created the custom topping. 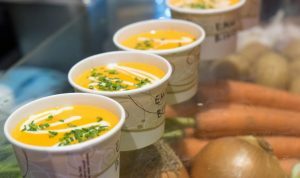 Leung developed the recipe (see below), worked out the budget and then spent an entire weekend pre-making 200 litres of soup that turned into more than 1,400 portions served at the event. The East Meets West Bistro beat out about 20 other Hamilton-area restaurants for the creative prize. 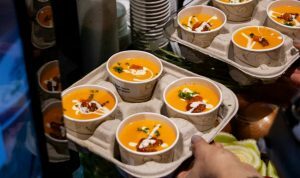 Visitors formed a long line in the Hamilton Convention Centre to get the vegetable puree base topped with fried chicken, ranch sauce and Tabasco pearls. Leung says he’s not usually a big fan of competitions, but he sees the value in participating in the event. Nine McMaster hospitality staff members volunteered to take shifts serving: John Barreda, Melanie Cottrell, Lincoln Crowe, Colin Hatherill, Hufriya Kateli, Kirsten Mak, Dixon Midigo and Michael Zhu.